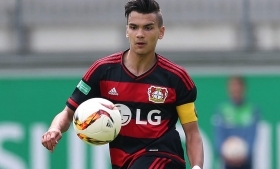 Bayer Leverkusen have produced some of Germany's best young players in recent times and have brought through yet another wonderkid in midfielder Atakan Akkaynak. The 18-year-old central midfielder, comfortable playing in defensive or offensive positions, is one of the best young players in Germany and has represented the country's under-17's, 18's and 16's sides. In recent times Leverkusen have enjoyed success at producing talent and Akkaynak follows suit, with the midfielder expected to join the country's full national team shortly. Capable playing anywhere in the heart of midfield, Akkaynak is an accomplished passer of the ball and has excellent positioning for such an inexperienced player. At Leverkusen he has recently forced his way into the Bundesliga's first-team squad and is expected to stay there for many years to come. Alongside Kai Havertz, Leverkusen have two of the best up and coming central midfielders in the world. Akkaynak is also strong in the tackle and is blessed with wonderful distribution ability, able to find players with his passing from range. His passing has been considered somewhat risky at times, but that is to be expected from a player of his age. Akkaynak has been compared to the great Michael Ballack, who also appeared for Bayer Leverkusen for many years. German and Bayer fans will hope that is the case, with this midfielder seemingly having the opportunity to become one of Europe's best midfielders.